Passionfruits are spreading vine plants that produce stunning, extraterrestrial-like flowers and flavorful fruit. Numerous varieties grow in gardens and run wild in Hawaii. 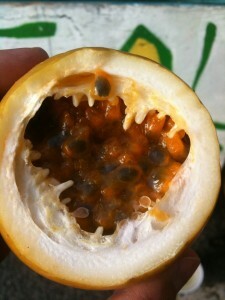 Yellow Passionfruit’ is the most common of the passionfruits in Hawaii and this is what is commonly known as lilikoi. Jamaican Passionfruit’ is the orange variety and also is known for its sweetness. The ‘Orange Passionfruit’ is the one with the hard orange skin. Then there is the ‘Giant Granadilla’ or Giant Passionfruit, it has large striking flowers and giant coconut sized fruit, though not as flavorful. It is high in vitamin C and some eat it to prevent oncoming colds. It is also prized for its juice which is distinct and highly acidic. – Always wash your lilikoi well before eating. – Most often just cut the fruit in half and eat it with a with a spoon, savoring the gel-like nectar and spitting out the seeds. It’s especially nice when you are in the mood for something tart, zesty and fruity. – Folks also use the juice to make jellies, fruit butter, sorbets, glazes and dessert toppings. All passionfruit lovers know that “the uglier the better” – more wrinkles, the more brown on the yellow, the riper the fruit. The shiny skin still beautiful ones need to sit out on the counter for a few days to ripen. Store ripe passion fruit in the refrigerator up to seven days, in an sealed bag to retain moisture. The origin of passionfruit is thought to be the Amazonian region of South America now known as Brazil. 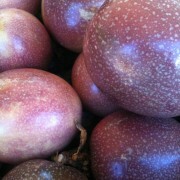 The purple passion fruit was introduced to Hawaii via seeds brought from Australia and were first planted in 1880. The vine took to the climate here and came flourish in home anti estrogens gardens, through sharing of cuttings, seeds and “bird plantings.” It quickly became naturalized in the lower forests and by 1930 it could be found growing wild on all the islands.